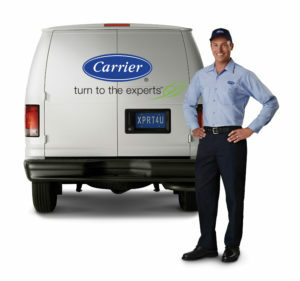 When it comes to high-quality, reliable commercial rooftop HVAC units, Carrier simply can’t be beaten. And, when you add in the proven installation expertise provided by Front Range HVAC, you get an economical, long-lasting HVAC solution that you can rely on for years. Performance. Whether gas-heated, electrically heated, or a hybrid of the two, Carrier delivers on performance in ways that most other manufacturers can’t. It’s heat-on-demand when you need it, cooler air on warmer days, and a worry-free product that can be trusted to perform year-round. Efficiency. Among the two rooftop unit options available to you—packaged or dedicated—efficiency ratings from Carrier lead the industry. Most units range from 11-16 on the EER/SEER efficiency scale, making them ultra-economical and great for the environment. Sustainability. Speaking of the environment, Carrier has gone to extensive lengths to engineer a ‘greener’ commercial rooftop HVAC unit. Using higher-quality materials, more refined manufacturing processes, and precision-made components, Carrier commercial rooftop units lead the way in sustainability. From smaller, electrically powered cooling units to larger, gas/electric hybrids like those in the WeatherExpert series, Carrier has you covered. And, when you take into consideration the fact that Carrier provides one of the most comprehensive, protective warranties in the business, the result is a commercial rooftop HVAC unit that stands the test of time. At Front Range HVAC, we don’t just sell Carrier rooftop units. We work with you every step of the way to determine the best product fit before scheduling installation, coordinating the entire project, and following up with you post-install to ensure that your needs are completely met. We know that we’re not successful unless your Carrier rooftop unit purchase and installation is successful. We’re happy to provide a no-cost, no-obligation quote you can take to the bank, and we proudly stand behind every commercial rooftop unit installation project we take on. And, because we’re a certified distributor of all Carrier products, you can rest easy knowing you’re dealing with trusted professionals with a direct line of communication to the manufacturer itself. When you’re ready to learn more about the performance, efficiency, and sustainability that can be yours with a new Carrier commercial rooftop unit, call Front Range HVAC at (303) 942-1372. We look forward to hearing from you!